The town of Monte Porzio Catone is located atop a hill about 25 kilometres south-east of Rome, some four kilometres east of Frascati. The town is easily accessible by bus from Frascati. The Camaldolese Hermitage lies in a valley between Frascati and the hill-top town centre of Monte Porzio Catone. 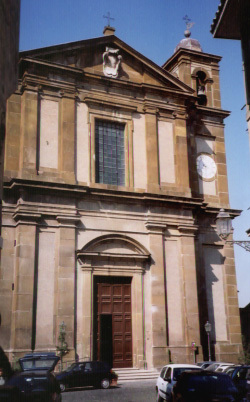 The Chiesa di San Gregorio Magno, which dominates the view of the town from the valley below, lies at the far end of the old town from the main square. To reach it, one enters the old town from the main square through the arch below Palazzo Borghese and goes straight ahead. 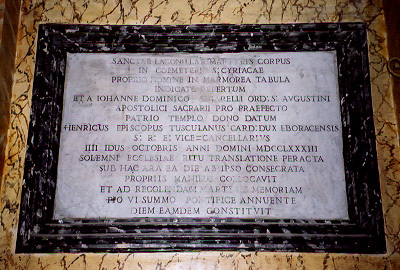 D. O. M. TEMPLUM IN HONOREM D. GREGORII MAGNI PAPAE PRIMI A IOAN. BAPTA BURGHESIO SULMONIS PRINCIPE CENTUM FERME ABHINC ANNIS RESTITUTUM A FUNDAMENTIS AMPLIATUM EXORCATUMQUE MARCO ANTONIO BURGHESIO SULMONIS PRINCIPE PATRONO POSTULANTE HENRICUS EPISCOPUS TUSCULANUS S. R. E. VICE CANCELLARIUS CARDINALIS DUX EBORACENSIS SOLEMNI RITU CONSECRAVIT KAL. JUNIIS AN. DNI MDCCLXVI TRANSLATAQUE ANNIVERSARIA EJUSDEM CONSECRATIONIS MEMORIA AD DOMINICAM SECUNDUM OCTOBRIS IPSUM EO DIE VISITANTIBUS INDULGENTIAM CENTUM DIERUM CONCESSIT CLEMENTE XIV PONTIF. MAXIMO. On the right side of the church towards the back is a small chapel, the Oratory of Saint Antoninus, a saint from Apamea in Syria. 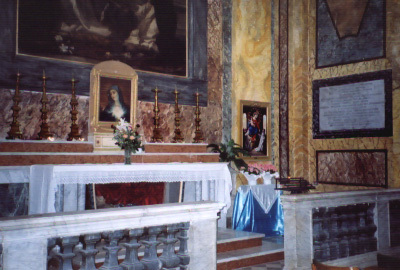 Henry acquired a part of the saint's right shoulder from Spain and brought it to Monte Porzio Catone in 1772 on the occasion of the consecration of the oratory. 1 Alessandro Atti, Il Cardinale Duca di York, Vescovo della Città e Diocesi di Frascati: Cenni Storici (Rome: Fratelli Pallotta, 1868), 40. Above the main door on the inside of the facade there is now (2002) an organ-casing. It is possible that the inscription still survives behind the organ, but is no longer visible. At Via Giuseppe Verdi 10, Henry, Cardinal Duke of York (later King Henry IX and I), established a school for young girls. in the year of our Lord 1773. This was one of several schools established by Henry. There is another in Velletri. The Camaldolese Monastery (Sacro Eremo Tuscolano degli Eremiti Camaldoesi di Montecorona) is technically located in the commune of Monte Porzio Catone, although historically it was part of Frascati. the Camaldolese placed [this monument] for eternity. According to several published works Henry's coat-of arms can be seen over the entrance to one of the buildings which flanks the church. 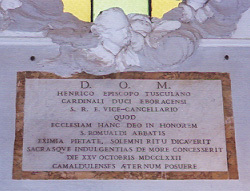 In the major historical work about the hermitage there is a photograph with the caption, "Stemma del Cardinale Enrico Duca di York Vescovo di Frascati, disegnato sulla parete dell' ingresso dell' appartamento detto pontificio" (Coat-of-arms of Henry, Cardinal Duke of York, Bishop of Frascati, painted on the wall of the entrance to the so-called pontifical apartment). But the illustration shows the coat-of-arms of Pope Pius IX. 2 I have not been able to determine if Henry's coat-of-arms are in fact anywhere displayed in the monastery. 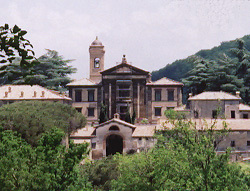 The monastery is located several kilometres from the centre of Frascati. If one takes Via del Tuscolo, the road soon begins to climb the mountain towards the summit with the site of the ancient town of Tusculum. After about three kilometres a road branches off to the left towards the town of Monte Porzio Catone. From here there are good views of the monastery which lies on the other side of a small valley. The road towards Monte Porzio Catone descends into this valley. On the right is a driveway with a black iron gate. A dirt road leads to a formerly rather grand entrance to the monastery up a long paved and tree-lined drive. The monastery (including the church) is not open to tourists; it is only open for devotional visits Monday to Friday from 8.15 a.m. to 12.00 noon and Saturday from 8.15 a.m. to 12.00 noon and from 3.00 p.m. to 5.00 p.m. 4 Only men may enter the monastery (including the church). Via del Tuscolo, 45. Telephone: 39.06.9449006. 1 Villa e Paese: Dimore Nobili del Tuscolo e di Marino (Rome: De Luca, 1980), 246. 2 Luigi Devoti, L'Eremo Tusculano e la Villa detta dei Furii (Frascati, Italy: Associazione Tuscolana "Amici di Frascati", 1981), 225. 3 Vicomtesse de Beausire-Seyssel, Madame Clotilde de France, Reine de Sardaigne, 1759-1802 (Paris: Honoré Champion, 1926), 83. Queen Marie Clotilde wrote about the visit in a letter to one of her brothers (either Louis XVIII or Charles X of France); she described the hermitage as "bien moins grand et moins beau que les nôtres" (somewhat smaller and less lovely than our own [in France]). 4 A sign at the entrance of the monastery reads, "Non si fanno visite turistiche né devozionali". This page is maintained by Noel S. McFerran (noel.mcferran@rogers.com) and was last updated July 17, 2005. © Noel S. McFerran 2000-2005.